Looking for a Greener Way to Market Your Brand? If you’re ready to design a custom reusable bag to market your brand and you’re not sure what material you want to use, why not consider jute? Promoting your brand with jute one of our biodegradable bag options is an eco-friendly way to market, jute is very durable, it is a stylish bag and we make it easy for you to design a reusable custom bag that puts your branding info front and center. Jute grows quickly and it does not require a lot of herbicides or fertilizers to grow so it is very “green” right from the start. When harvested, the jute fibers are woven into a fabric that is very strong, making it an ideal choice for reusable bags. Jute is eco-friendly when used to create reusable bags because it reduces the need for disposable plastic bags. Since jute is a natural fiber, it is even more eco-friendly because it is biodegradable. This means after it fulfills its usefulness as a custom reusable bag, your customers will be able to easily pop it into the recycling bin to dispose of it in an environmentally responsible manner and should it end up in a landfill, it will safely break down. 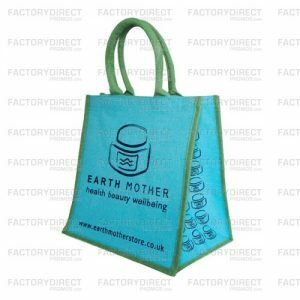 Creating your own jute bag gives you the opportunity to design a bag that looks like you want it to, puts your branding info on display and is handy for your customers to use. You can select the style of bag, the size, the color, the length of the handles, and add embellishments like contrasting trim or gussets or pockets or closure. You can also choose the color of the ink used to imprint your logo and branding info on your custom reusable bag. Depending on your preference you can choose between a laminated finish or go with a more natural cloth-like texture. The laminated finish is smoother and sleeker while the cloth-like texture has a more natural look. Both options offer durability and it comes down to what you prefer and what fits the look you want for your custom reusable bag. I love my jute bags because they last for so long and I always get compliments on them. 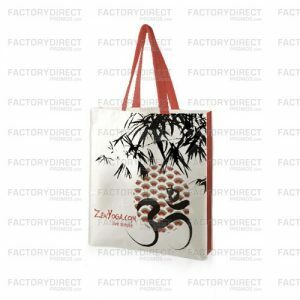 Once you’ve designed your completely unique customized reusable jute bag, we will build your order at our overseas factory. When you place your order you will also need to decide on the quantity. Keep in mind that the more bags you order the lower the price per bag, so stock up. Turnaround of custom orders typically takes 60 – 90 days, but the end result is well worth the wait. To learn more about the benefits of jute check out this post about the 10 Benefits of jute and if you have questions about the design process or if you’d like a quote or you’re ready to get started and place your order get in touch HERE.